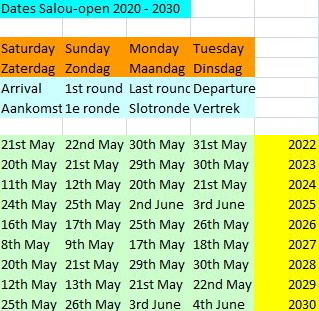 We invite you to participate in our 22nd international open draughts tournament in Salou, that will be played from Sunday, May the 26th until Monday, June the 3rd, 2019. The tournament will be played with 9 rounds Swiss system with rating. The complete program is shown below. As all former years the tournament turns out to be a great event. After the enormous success of the last years, we are sure the participants will succeed in having a good time, because of the combination of a good holiday near to the beach (50 m), a fine hotel-accommodation and most of the time a spectacular draughts tournament in which excellent draughts players as well as the weaker ones participate. The accommodation for the tournament is for the seventeenth time Hotel Cala Font in Salou. The subscriptions in the last years were much more than the maximum number of 140 participants. The first 65 participants from The Netherlands and the first 65 participants from not-Netherlands have a play-guarantee. Thereafter the subscribers will be put at a waiting list. Though: subscribing as soon as possible is absolutely necessary. The participation fee for the tournament is € 60,--. The money prizes (in number and height) will depend on the number of participants. The first prize will be € 800,--. Other prizes will be paid for highest classifications, the best women, best seniors (over 55 years), best youth players, best combination or best game and a "surprise - prize" for some of the weaker players. Hotel-accommodation (full board) is available for the price of € 440,-- per person (including the tournament) and is based on a two-person room. For persons, who don't participate in the draughts tournament, the price per is € 405,-- per person. The staying in a single room cost € 200,-- more (10 days). Extra days in the hotel cost per person € 35,-- (with two persons in a double room) and € 55,00 in a single room. A reduction of 5% will be given to the people, who already participated in one of the former tournaments in Salou. The hotel accommodation is Hotel Cala Font and breakfast, lunch and dinner are included. There will be transfers from the airport of Barcelona to Salou and the airport of Reus to Salou on Saturday May 25th and from Salou to Barcelona and Reus on Tuesday June 4th. The costs for both transfers (together) is for the airport of Barcelona € 40,-- per person and for the airport of Reus € 20,--. WARNING: No transfers from Girona.